Prue came to me with grand ideas of having a garden party by the beach for her wedding. I thought this was great, a perfect venue at Beaumaris Motor Yacht Squadron all we needed was the perfect day which luckily we got. The arch arrangement looked perfect with the setting of the blue sky, water and the green grass on the hill. I made a long arrangements which was tied onto the archway and 4 pedestal arrangements for either side of the red carpet. 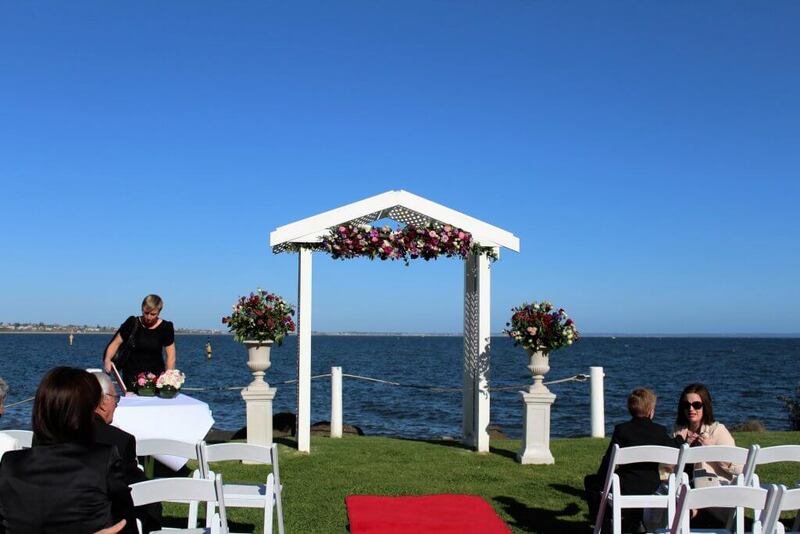 This entry was posted in Bayside Weddings and Events and tagged #baysidebouquets, #beachweddings, #beaumaris, #blackrock, #buttonholes, #corsages, #easyweddings, #melbourneweddings, #roses.